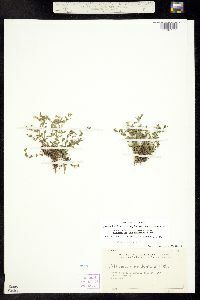 Plants ± strongly perennial, pos-sibly blooming first year, not matted. Taproots filiform to moderately thickened; rhizomes often present, slender, 2-15+ cm. 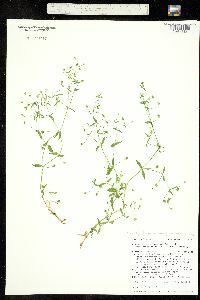 Stems 1-80+, erect or ascending to procumbent or prostrate to trailing, green, 5-60 cm; internodes terete to angular, 1/ 3-8+ times as long as leaves, dull, retrorsely pubescent throughout or in lines, hairs minute. Leaves usually connate basally, with scarious sheath 0.1-0.5 mm, occasionally petiolate (proximal leaves) or sessile; petiole 2-5 mm; blade 1-veined, vein prominent abaxially, linear-lanceolate to narrowly elliptic or oblanceolate, 3-35 × 2-14 mm, herbaceous, margins thickened, scarious, shiny, ciliate proximally or throughout, apex obtuse or acute to apiculate, often minutely pustulate, ciliate on margins and adaxial midrib; axillary leaf clusters absent. Inflorescences axillary, solitary flowers or in proliferating, mostly terminal, leafy, 1-80+-flowered cymes. Pedicels erect to ascending (often arcuately so), or straight to widely divergent, often hooked distally in fruit, 2-40 mm, retrorsely pubescent. Flowers: sepals green, 1-3-veined, 2 lateral veins 4-3/ 4 times as long as midvein, often appearing prominently keeled proximally, lanceolate to ovate (herbaceous portion oblong or lanceolate to ovate), 2-5 mm, to 5.5 mm in fruit, apex acute to acuminate, not pustulate, glabrous; petals narrowly spatulate to obovate, 1.5-6 mm, 2-1 5 times as long as sepals or absent, apex obtuse to rounded, petals sometimes absent. Capsules ± loosely to tightly enclosed by calyx, ovoid, 3-6 mm, 5-1 2 times as long as sepals. Seeds 8-35, black, suborbicular, slightly compressed, 0.7-0.8 mm, shiny, smooth. 2n = 40, 44. 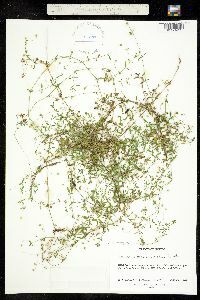 Duration: Perennial Nativity: Native Lifeform: Forb/Herb General: Small herb 5-60 cm tall, lax and spreading, sometimes erect and ascending, with up to 80 slender stems, internodes terete to angular, pubescence ascending in lines along the stems. Leaves: Basal leaves connate (fused together) with a thin sheath, proximal leaves petiolate or sessile, linear lanceolate, midvein prominent on the underside of the leaf, opposite, shiny and sometimes ciliate. Flowers: Axillary inflorescences, borne singly or in cymes, flowers white with 5 obovate petals, sepals bright green with 1-3 veins, lanceolate to ovate, ovary superior and evident at the throat of the flowers, stamens many, anthers white to light pink. Fruits: Ovoid capsules held within the calyx, seeds black. Ecology: Found in coniferous forests from 5,500-12,000 ft (1676- 3658 m); flowering May-September Notes: This small plant is easy to overlook, however, its small white flowers catch the eye, especially when the anthers are pink. 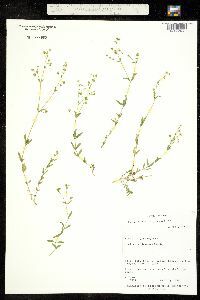 The leaves can sometimes appear whorled from a distance, making the plant look like a Galium, but closer inspection will reveal the paired leaves, often sessile and clasping at the base. Ethnobotany: An infusion of the plant was used to treat colds, eye infection, pimples, and venereal disease, and a cold compress of the plant was placed on the forehead to treat headaches. 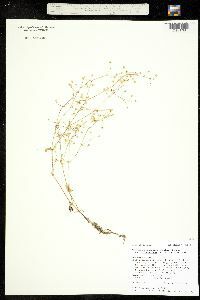 Synonyms: Arenaria lanuginosa subsp. 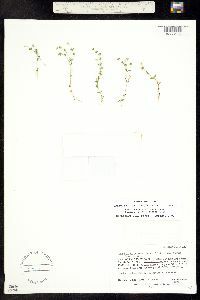 saxosa, Arenaria confusa, Arenaria lanuginosa var. cinerascens, Arenaria saxosa, Arenaria saxosa var. cinerascens, Arenaria saxosa var. mearnsii, Spergulastrum lanuginosum subsp. saxosum Editor: LCrumbacher, 2011 Etymology: Arenaria comes from the Latin arena, "sand," referring to the sandy habitats of many species, while lanuginosa means woolly or downy. Lax perennial; stem retrorsely puberulent, to 5 dm; lvs narrowly lance-elliptic or elliptic-oblanceolate, 15-30 נ2-8 mm, ±pustulate, ciliate at base; pedicels axillary, slender, mostly 1.5-4 cm, ascending to reflexed, puberulent; sep lanceolate, 3-4 mm, acute or acutish, 1-nerved, glabrous, often pustulate, sometimes ciliolate at base; pet minute or usually none; seed 0.6-0.8 mm, flattened, somewhat keeled dorsally, smooth, shining, black or dark reddish-black; 2n=44. Open woodlands and rocky places or damp thickets; se. Va. to Ark., s. to tropical Amer. Our plants are var. 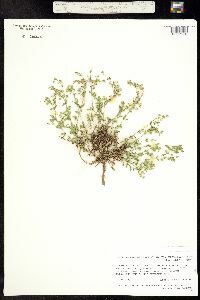 lanuginosa.